Catherine Murphy's kinetic mobile moves with the slightest breeze, sending the flock into a graceful ballet. A bevy of vibrant butterflies soar into your home with Catherine Murphy's kinetic design. 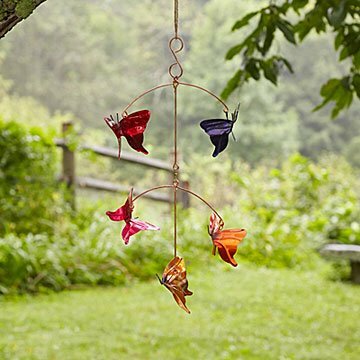 She handcrafts the graceful mobile from copper, painting each winged creature a rich color, and setting them "aflutter" on weather-resistant wires. With the slightest breeze, the flock begins a stunning ballet, twirling and spinning to nature's hum. Handmade in Asheville, North Carolina. Finished with a clear coat, designed for year-round outdoor use. I use it as a decorative item in living room. It is substantial and well crafted by the artist. Just lovely. Don't think I'll put it outside to weather! Purchased this for my mother on Mothers Day; she loved it so much that she immediately hung it in her bay window and has refused to move it, or consider taking it outside - not because she's concerned it would weather, but because she wouldn't get to see it as much. The colors are incredibly vivid, worth every penny! This is absolutely beautiful. The pictures online don't do it justice. The colors are vibrant and shimmer when the sun hits them.